The Gospel in context, always! Reading the scripture with purpose. The Gospel in context, always! Reading the scripture with purpose. The Wordly NEVER understand Holy Things! Today’s gospel, like most Gospel selections, must be read in context in order to be understood. 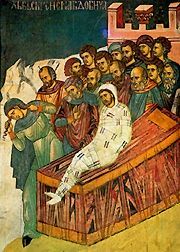 Luke 9:7-11 7 Now Herod the tetrarch heard of all that was done by him: and he was perplexed, because that it was said of some, that John was risen from the dead; 8 And of some, that Elias had appeared; and of others, that one of the old prophets was risen again. 9 And Herod said, John have I beheaded: but who is this, of whom I hear such things? And he desired to see him. 10 And the apostles, when they were returned, told him all that they had done. And he took them, and went aside privately into a desert place belonging to the city called Bethsaida. 11 And the people, when they knew it, followed him: and he received them, and spake unto them of the kingdom of God, and healed them that had need of healing. When we hear this selection in church, we are not reading the surrounding verses which often help elucidate the passage, but if we are students of the scripture, we will remember the context. We should know the scripture better than any book. It should be intimately familiar to us. There is only one way for that to happen! We must read the scripture often, with purpose! Actually, there are two more ways to make this happen. The Scripture is particularly “understandable” when it is read in the services (all of them, and not just liturgy). I have experienced this countless times myself. Somehow, the Holy Spirit especially enlightens us concerning the Holy Scriptures when we are standing in prayer in the temple. These may be particular passages which are read verbatim, or paraphrases and allusions to scriptures passages and themes which abound in our services. If we want to truly understand the Holy Scriptures, we must hear them used in worship, and participate in this worship with inner effort. When we are worshipping with the Scriptures, we are training ourselves how to think concerning them. This activity is more profitable to our souls than the reading of a thousand biblical commentaries by the Fathers; without it we will never understand those commentaries! Of course, enlightenment is not possible in anything pertaining to God without our personal effort. This is the “third way” to understand the scriptures. What does reading the scripture “with purpose” entail? We are reading the word of God, and at that moment, God is speaking directly to us. There is something that we are to learn, at the very moment we are reading (or listening). What is it? We must be a seeker after “goodly pearls” when we read or hear the scriptures. There is something precious that God wishes to communicate with us. Being aware of this, and eager is what “reading (listening/praying) with purpose” entails. In this passage, Herod epitomizes the typical person in the world, which in another place, the scripture calls the “wayside” or sometimes, the “shallow, rocky ground”. He is a little bit interested in spiritual things, much as he might be interested in the latest news at 10 or what his favorite sports team did the previous night, but because he is not really seriously trying to amend his life, he does not understand these things. Herod had spoken with John many times – the scripture says he “heard him gladly”, and yet he still is confused about who Jesus is. This is because understanding about holy things only comes to those “who have ears to hear”. Most of the world is like this. Many who are Orthodox are like this! We cannot understand holy things unless we strive to live with holiness. This is a lesson we had better learn. The subsequent verses from the Evangelist Luke (and also John) help elucidate this passage and provide an important lesson. Many people, after they heard Jesus teaching concerning His body and blood, the Holy Eucharist, left Him and never came back. They were like Herod – worldly and fleshly and not attuned to spiritual things. The Christian should tremble when he reads: “From that time many of his disciples went back, and walked no more with him”, because the same passions that operated in these people’s souls and rendered them incapable of understanding holy things operate in us to a greater or lesser degree. May reading about Herod and the Lord’s former disciples who left him, and the people of the Gergesenes, and all the rest who had God in their midst and did not understand Him or follow Him humble us so that we pursue the way of humility and do not repeat their errors. God gives grace to the humble, but resists the proud. If we are proud, there is nothing that protects us from becoming just like Herod. May God preserve us from this fate! Herod should have known this. The reason he did not know it is warning to us. 7:30 PM, Moleben with akathist, concelebrated by many local clergy. Many will be seeing our new temple for the first time. We will be privileged to offer everyone hospitality in the hall afterwards, and give as many as possible an opportunity to be alone and pray before the icon. On 8 September, 1295, on the day of the Nativity of the Most-Holy Mother of God, a small force of hunters from Rylsk came to hunt at the Tuskora river, 27 versts from Kursk. One of the hunters, an honorable and pious man, seeking prey in the woods, found a small icon lying face down on the root of a tree. He had barely lifted it to inspect it when the spot upon which the icon lay burst out with a strong spring of pure water. 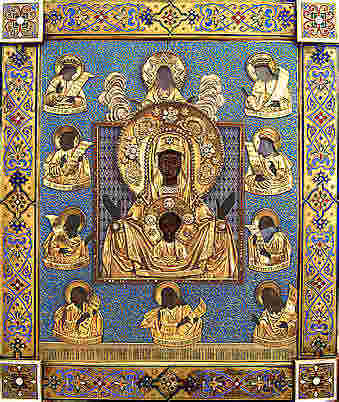 The icon turned out to be of the type referred to as the "Sign" of the Mother of God. The hunter who found the icon knew that this was no ordinary occurrence. He called his companions and together they built a small wooden chapel, into which they placed this icon. The residents of Rylsk, hearing of the newly-appeared icon of the Mother of God, began to visit it for veneration, and many miracles began to appear from it. In 1676 the holy Icon traveled to the Don River for blessing the Don Cossack troops. In 1684 Tsars Ivan and Petr Alekseevich sent a copy of this Icon with the order that it accompany Orthodox troops into battle. In 1687 the holy Icon was sent to the "Great Army." 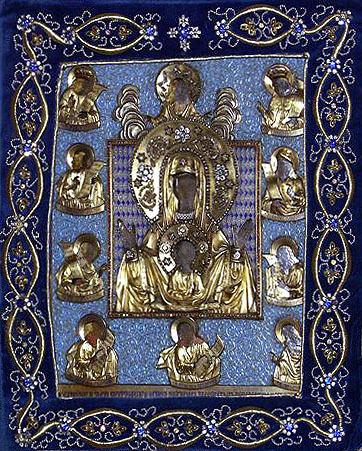 In 1689 copies of the holy Icon were given to the armies in the Crimean campaign. In 1812 a copy of the holy Icon was sent to Prince Kutuzov and the battling troops. Before his icon St. Seraphim of Sarov prayed and was healed. The Widow of Nain. 3rd Sunday of Luke. Oil and wine. Audio Homily 2010. Galatians 6:11-1811 Ye see how large a letter I have written unto you with mine own hand. 12 As many as desire to make a fair shew in the flesh, they constrain you to be circumcised; only lest they should suffer persecution for the cross of Christ. 13 For neither they themselves who are circumcised keep the law; but desire to have you circumcised, that they may glory in your flesh. 14 But God forbid that I should glory, save in the cross of our Lord Jesus Christ, by whom the world is crucified unto me, and I unto the world. 15 For in Christ Jesus neither circumcision availeth any thing, nor uncircumcision, but a new creature. 16 And as many as walk according to this rule, peace be on them, and mercy, and upon the Israel of God. 17 From henceforth let no man trouble me: for I bear in my body the marks of the Lord Jesus. 18 Brethren, the grace of our Lord Jesus Christ be with your spirit. Amen. The Widow of Nain This is our life in microcosm. 20th Sunday. 3rd Sunday of Luke. Brothers and sisters, our Lord Jesus Christ healed thousands that we don’t know about. Only a few of His miracles are recorded in the Gospels. Therefore, the ones that are recorded are particularly important; we must take careful notice. This is one of my favorite ones because it is very deep. There’s a reason why the Evangelist Luke says the things he does. The miracle could have been described much more laconically, but he gave certain very specific details that are very, very important. This miracle is really our life in microcosm. The Lord is going through Nain. Many people are flocking about Him, and while so many people are joyfully receiving Him, a woman is full of sadness, who is a widow; her son is dead and they are burying him today. This is in microcosm our life, because there is a lot that is dead in us. You know, only the Orthodox, as far as I know, talk about this. It’s not really a pleasant subject to know that there’s darkness in us, to speak of it often, to speak of the death that is in us. People who do not feel this darkness think that such talks is “negative” or shows “poor self-esteem”, or even indicates a “lack of faith”. But it’s true. If you’re honest with yourself, you’ll see it. When your heart turns and has that constricting feeling when something happens, that’s darkness. So this woman’s sadness let us equate to the darkness that is in our hearts. So now she is going with a large group and they are going to bury her son; they are doing the funeral procession. And our Lord, Who’s a complete stranger to this woman, tells her, with absolutely no explanation, cease weeping, don’t weep, don’t cry. Only our Lord can say these words, because only our Lord can heal. Simon Peter, when he was asked by the Lord to fish after the full day of preaching and the sun was high in the sky and the fish were far away and not catchable, he said, “Nevertheless, I will let down the nets.”  He had no idea why the Lord would give such a command. It didn’t make any sense but he did it. The Lord says things to us that are unintelligible all the time such as saying to this woman, “don’t cry,” or to Peter, “let down the nets”, or “love your enemies.”, but they will make sense in the end. They will make sense if we listen and if we obey. And the only way we will understand is through gaining wisdom through experience. So the Lord says to this woman, “Don’t cry.” Now, sometimes there’s a long time between the Lord saying something to us and it coming to fruition. The Lord says that we will be perfect. Well, we’re not very perfect looking, are we? So it must be a long time before that is fulfilled. The Lord says that we will have treasure. Well, we don’t have a lot of treasure. And of course I’m not speaking of anything that is material. But there’s still a lot lacking in us. It takes a long time for some of these things to be fulfilled. The Icon “Sweet Kissing” teaches the exact same dogma concerning our Lord Jesus Christ as the action of our Lord touching the bier: He is a man, and understands man, and loves mankind. In this case, because it is one event, the fulfillment happens very quickly. The Lord puts His hand on the bier. This is a very significant action – it shows that the Lord is Man and God. Not only does He love man because He has become a man, but he understands what it is to be a man. That’s what that action of touching the bier means. He loves mankind, and He understands mankind. So when He says, “Stop weeping,” He knows from experience that His words make sense. When He says, “Love your enemies,” He knows from experience that this is the only way that we can have peace and happiness. And all the rest of His commands, He commanded and He fulfilled the command in His flesh. So He speaks with authority like nobody else can. Because He understands what is the result of the things that He says to us. We only understand them darkly, as it were, in a glass. But the Lord sees clearly what His commands will bring if we obey them. We must just trust Him that His commands are good and that, as He said, His yoke is not burdensome. His yoke is easy and His burden is light. We must just follow Him, even though it doesn’t always make sense. So He touches the bier to show us not only His love for mankind but His understanding of mankind. His way IS the only way to happiness, to peace, to security. There IS no other option and He knows it. And He will share it with us. So what happens when He touches the bier? Another very important action that the apostle tells us. They stand still, which perhaps at first glance seems to be an obvious and irrelevant point. I don’t think it is obvious at all. I think most of the time we keep just right on going because the Lord is touching us all the time. He is always saying to us, weep not, or some other words of encouragement or rebuke, and we are not hearing Him. And perhaps He touches us and we don’t feel Him. But these people did and so they stopped and stood still. I always recall, when I read these words, the Prophet Elijah . After forty days of travel he went to the mountain. And the Lord was not in the earthquake or the flood or the fire; but there was the still small voice like a rustling wind, and the Lord was in the wind. But he was still in order to be able to hear it, because you can’t hear a little tiny rustling wind if you’re making noise yourself. So the people stood still, but not understanding why the Lord had given the command, why He had told this woman who had lost all of her living, as a widow having no substance anymore because her son was dead, why she would be told not to weep anymore. In fact, I would dare say that many people would have thought that to be a cruel comment, a cruel remark. And then He stops the procession, prolonging the woman’s agony, in the minds of some. But no, He was to heal the boy. He was to raise him from the dead. This is our life in microcosm. When you read — This is why I tell you so often — When you read the Scriptures, personalize them. This is you. You could say you’re the boy. I’d say more that we are the woman with sadness, with difficulty, with passions, not understanding really what we’re going to do the next day and having the Lord tell us things that we really don’t understand. And yet in the end our son will be raised; we will become perfected. This is our life. I hope you feel this deeply in your soul how powerful this is. The only way to peace, to happiness, is to follow Christ. But Christ did not give us some sort of exact outline, as you would in some sort of lecture class, exactly what you need to know. He says, follow me, do what I do. And because of our passions, because of our sins, we don’t understand a lot of times why we should do a thing or we don’t feel any satisfaction from it. Intellectually we can say why we should love, why we should become compassionate, why we should not lust or we should not gossip; or we should pray when we are tired. We know these things intellectually, but it has not penetrated every ounce of our being as it did our Lord. So we don’t have a full understanding. There’s a lot in which we’re in the dark not because the Lord will not reveal it to us, but because we cannot take it in, because the only way to become good is to follow the Lord. From the moment He was born to the time He died, His face was set to Jerusalem. He came for one purpose and one purpose only, to save us. And EVERYTHING He did was for that purpose. And He understands us, more than we understand ourselves. So let’s trust Him, not in a superficial way, but completely and totally. Let’s believe Him when He says: There will be a time when you will no longer weep. Let’s believe Him when He says: You will become perfected. Let’s believe Him when He gives us the Commandments and that they will be the only path to happiness. So this miracle is our life in microcosm if we choose to live it. May God grant us the wisdom to see as He reveals to us the truth. You have to stand still for the truth, brothers and sisters. You have to listen for the truth. You have to follow things even that don’t make a lot of sense. May God help us. Newsletter 2010-10-24 – with Kursk Root Icon Visit information. Having obtained thee as an unassailable rampart and wellspring of miracles, O Most Pure Mother of God, thy servants quell the assaults of enemies. Wherefore, we pray to thee: Grant peace to our land, and to our souls great mercy. The Holy Kursk Root icon of the Theotokos will be visiting our parish on this Friday, October 29th. 8 AM Divine Liturgy, in the presence of the Kursk Root Icon. After passing El Dorado St., you will soon see a large “Pawn Shop” sign on your left. Keep straight. Just after this sign, turn left at Christian Street. The Church is ahead on your right. Monday, October 25th: Anniversery of the repose of Reader John Wilder, a founding member of our parish. Memory Eternal! If you have corrections or additions, e-mail Deacon Nicholas. We would love to announce your birthdays and anniversaries as well, but our records are very incomplete, so please give us this information. For a more complete listing, please see our parish prayer list. Our "Redeeming the Time" blog usually has at least several posts a week – http://www.orthodox.net/redeemingthetime. Wednesday and Friday of this week are fast days as usual. The Kursk Root icon of the Theotokos will be in our area Friday, Oct 29th (civil date). SCHEDULE. 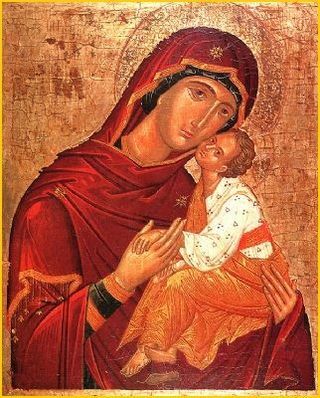 This icon has been in the Russian church for many hundreds of years. It has been involved in thousands of healings, including my patron, St Seraphim. I will pick up this 800 year old, miracle working icon late Thursday night. Friday Oct 29 – 8 AM – Divine Liturgy. Throughout the day until arrival back at church the icon will be brought to over a dozen places for a blessing and short moleben. I have not worked out all details for when and where I will be. It turns out that I will be going to Plano, Richardson, Dallas, South Dallas, Duncanville, Rowlett and Carrollton. This traces a rough cross. I believe I will be able to honor all the requests for visits. Friday Oct 29 7:30 PM Moleben with Akathist. I am inviting all the local clergy to serve at this moleben, through email and by calling as many as possible. I hope many will come, and pray before this holy icon. I anticipate we will share in the task of reading many names before the holy icon, as well as in chanting parts of the Akathist. (Bring BLUE vestments, including phelonion) After the service, I plan to try to allow anyone who desires a short time before the Holy icon with relative privacy (only Fr Nicholas or myself will be in the temple). I encourage everyone to print (ONLY) the names of those they wish to be commemorated before the icon, or bring a typewritten list. NO CURSIVE PLEASE. Please note that I will commemorate all my parishioners in any case. We will take up a collection for the icon, as is customary. We also plan to have refreshments (Lenten, of course) for after the service. This is not only a blessing to be in the presence of this holy icon, but also an opportunity to give hospitality to many of our local Orthodox brethren. Galatians 2:16-20. Christian vs Jewish justification, and why it is important. Audio Homily. 21st Sunday after Pentecost. Synopsis: Galatians was written to a group of Gentiles that had been infected with Judiazing teachings; they had been taught that they were required to fulfil the rituals of the Jewish law (circumcision, washings, dietary laws, etc) to be saved. All of Galatians refutes this heresy, and teaches why Christians must be moral. This passage particularly highlights the differences between Jewish justification (which was only an external declaration) and Christian Justification, which is also a declaration, but also involves the inner man becoming righteous – that is, the obliteration of sin (not just forgiveness), and eventual perfection. Why should we care about the difference between the Jewish view and the Christian reality? Because almost everyone, to a greater or lesser degree often lives and thinks as the Jews did. Synopsis:The first Great catch of fish, read in context with the 2nd great catch (which occurred three years later, 8 days after the resurrection) is truly the "Gospel" – the "Good News", because it is a promise to us that we can change and truly become holy – all we need do is be with Jesus Christ throughout our life. We compare the two great catches, and explore what it means to be with Christ. The Epistle reading is from Galatians, them overall theme of which is that we cannot be saved bu . We are not saved by works, but we cannot be saved unless we stay with Christ throughout our life – we examine what this means. Shortly before World War I, a Turk visited Fr. Iieronymos' humble hermitage. The Turk told the elder that his master, a judge, had sent him to invite the elder to his house. The elder became a little worried. He was not accustomed to receiving invitations to "social receptions" and his mind began to suspect that he might experience some evil or temptation. However, he prayed to God and followed the Turkish servant. "Efendi papa, I am a Turk, a Moslem. From the salary I receive, I keep whatever is necessary for my family's support, and the rest I spend on alms. I help widows, orphans, the poor; I provide dowries for impoverished young women so that they can get married, I help the sick. I keep the fasts with exactness, I pray and, in general, I try to live a life consistent with my faith. Also, when I sit in judgment, I strive to be just, and never take a person's position into account, no matter how great he is. What do you say? Are all these things that I do sufficient for me to gain that Paradise that you Christians talk about? The elder was impressed by all that the Turkish judge told him, and he immediately brought to mind the Roman centurion Cornelius mentioned in the Acts of the Apostles. In the Turkish judge and the Roman centurion he perceived two similar lives. He understood that the judge was a just man of noble sentiments. "Perhaps," thought the elder, "my mission is like that of the Apostle Peter, who instructed the Roman centurion." The elder determined, therefore, that he would bear witness to his Faith. "Tell me, efendi cadi, do you have children?" "Which of the two carry out your orders better – your children or your servants?" "Assuredly, my servants, because my children – with the familiarity that they have toward me — often disobey me and do whatever they wish, whereas my servants always do whatever I tell them." "Tell me, I pray thee, efendi, when you die, who will inherit your wealth – your servants, who executed your wishes faithfully, or your children who disobey you?" "Well, my children, of course. Only they have rights of inheritance, whereas the servants do not." "Well then, efendi, what you do is good, but the only thing your good works can is place you in the category of those that are good servants. If, however, you desire to inherit Paradise, the Kingdom of the Heavens, then you have to become a son. And that can be accomplished only through Baptism." The Turkish judge was greatly impressed by the elder's parable. They spoke for a long time after this, and at the end he asked the elder to catechize him and baptize him. And thus, after a little while, the good judge was baptized and became a Christian. 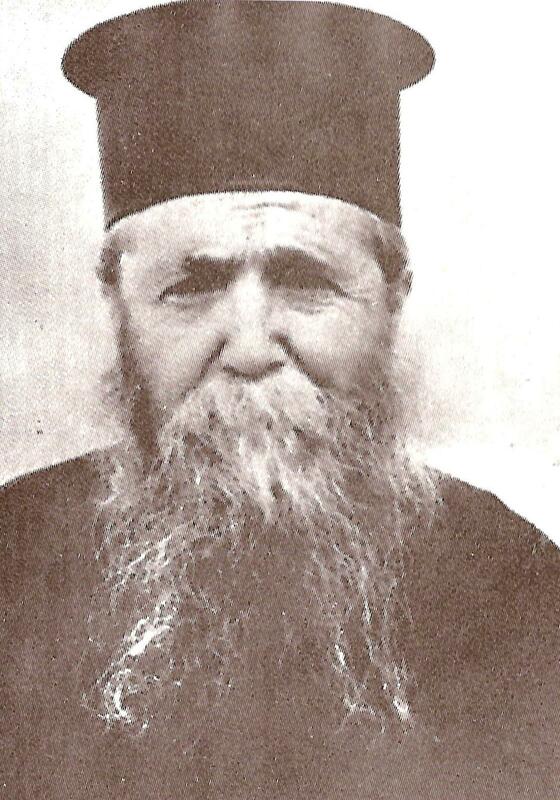 Translated from "The Elder Hieronymos, the Hesychast of Aegina," by Peter Botsis, Athens, 1991. Cadi is the Turkish word for "judge." You are currently browsing the Saint Nicholas Orthodox Church blog archives for October, 2010.